The images below were taken of the Glen Iris Lawn probably between the mid 1880s and 1900. In addition to interesting views of what is now the Glen Iris Inn, the photographs help to document the landscaping of the later Glen Iris Era. A short discussion of each photograph is found below the image. Although the photographer is not labeled, the images are very similar to Walker stereoviews of the same time period. We thank Karen Gibson Strang for sharing these images with us. When the above image was made sometime in the late 1880s or 90s, the photographer was standing in the "new" road to the Glen Iris from the main estate gates and in a southernly direction. When William Webster originally designed the grounds in the early 1860s for Mr. Letchworth (see map), the entrance gates stood on the Glen Iris north lawn. Compare this view to Image 25. The trees to the left are probably native species such as sugar maple. The large tree that occupies most of the right of the photo is probably the large American elm that once was an outstanding specimen until the Dutch Elm disease hit the area. That same tree is also visible in Image 134. Small changes in the landscaping give the impression that this view was made a few years after the top view. 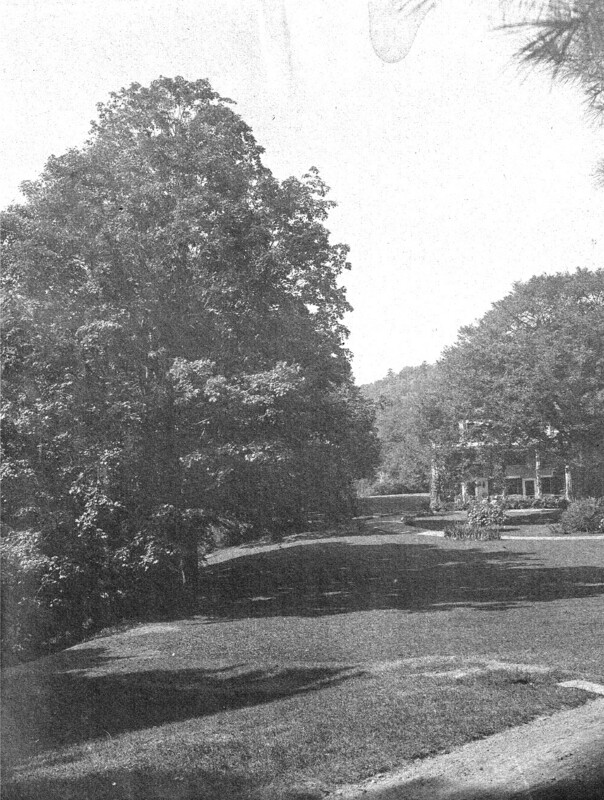 The circular drive is still used at the Glen Iris Inn today. Two of the trees in the background to the right may also still survive. They could be white pine, but there is a good chance they are the hemlock that are still there. On the far right is a bed of Canna lilies which would have produced very showy red flowers for a good part of the summer and the fall. It is likely that later gardeners probably got rid of them after the land became a park because they have to be dug up each fall and stored in controlled conditions over winter and then planted again in May or very early June. This cyanotype is date 1897. The photographer is now looking toward the north and the road to the main gates can be seen in the distance. Most of the trees in the view appear to be broadleaf (hardwood) and are probably all gone. Part of the upper crown at the corner of the roof appears to be the white pine that was taken down shortly after 1968. There were a couple of white pines close to the Glen Iris that were stormed damaged and had to be removed around that time. The vines on the pillars is probably Dutchman's Pipe. 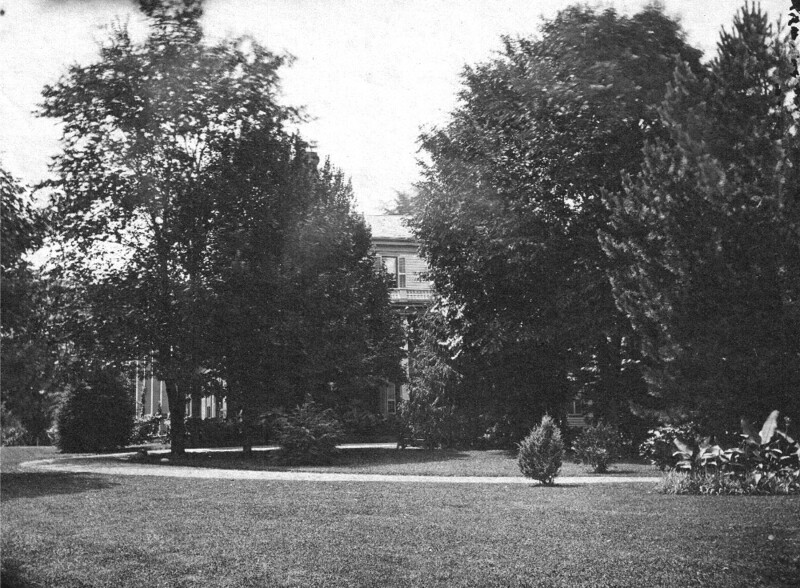 The three windows above the porch were (and still are) the windows to Mr. Letchworth's study. The shutters to the first two are closed, but the last pair are open - perhaps Mr. Letchworth is at work at his desk?